What does it mean to be young? What is it about youth that we connect to? Why does a show like Daria connect so effortlessly with us more than a decade since it first aired? Sure technology is different, society is different, the world is different. But there is one thing that will never change, that unbridled youth inside of us all. We may repress it, but no matter how hard we fight it, we all long for the days when things were simpler. Times change and so do we, but that youthful rebelliousness lives on long after we outgrow it, it lies in the depths of our being, serving as a reminder of who we once were. This is why a show like Daria is still as effective more than a decade on, because it captures a moment in time that we all go through on the path to adulthood, those vapid fleeting days of youth. Whether you are young or just young at heart, Daria will connect with you. Daria much like other animated series of the time (The Simpsons, King of the Hill) features a basic formula that can be bent into just about any kind of story. It also features an eclectic expansive cast of characters that are all fully realised, with a large variety of different personalities to play off of one another. This is where Daria’s heart is, it’s characters. 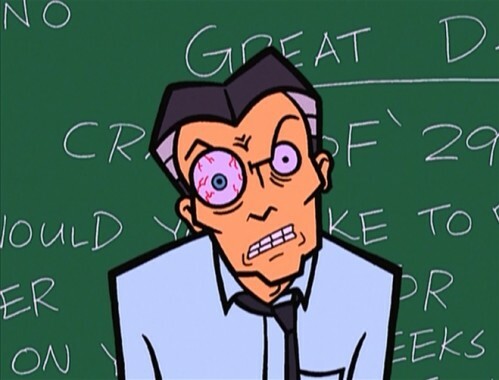 The cast of Daria is immense and there is definitely going to be at least one character you can relate to. The large majority of the humour in the series comes from the interactions between these characters. 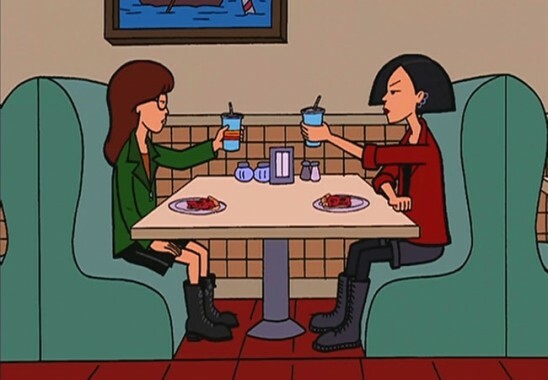 Whether it be the cynical titular character Daria conversing with the airheaded Brittney or any other combination of characters, everything feels so organic and the laughs come in quick succession, with witty biting dialogue that you just don’t see these days (a hallmark of 90’s comedy). This shows greatest strength is it’s grounding in youth culture, something that has given the series longevity many from the same time just plain do not have. Youth’s of 2012 can easily empathise with any number of characters or plots in this show, and even the Youth’s of the past can look back at Daria with nostalgia. The entire culture of being young is universal and it gives Daria something that many shows can only hope for; timelessness. 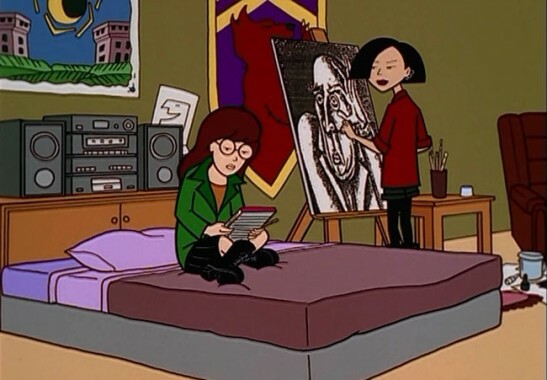 Aesthetically and aurally Daria shows it’s age. It’s not high definition and it’s soundtrack very much inhabits the late 90s, but none of that matters. 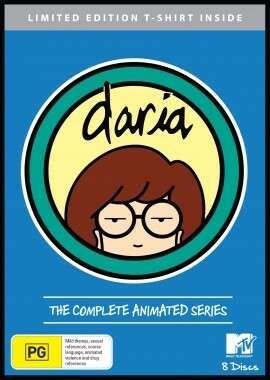 Does Daria look more than a decade old? Yes, but that’s just fine. It is a visually satisfying experience, untarnished by modern conventions, allowing Daria to remain in it’s original state and that is in fact a beautiful thing. It’s rough around the edges, and simplistic, much like the youthful spirit it embodies. From an audio perspective Daria features an appropriately rebellious soundtrack coupled with the superbly performed voice acting. Everything just clicks with this show, from the brilliant opening theme song ‘You’re Standing on My Neck’ to Tracy Grandstaff’s impeccable performance as Daria Morgendorffer, everything just clicks. It undoubtedly the most definitive release and a must have for fans of the show and for the asking price this is an absolute steal of a release. There is simply so much content, that I must commend Beyond Home Entertainment. This is how you do a Complete Series release. Daria is an uncompromising look at youth culture that is equally hilarious as it is engaging. Anyone that has ever been young will relate to this show on multiple levels. It will speak to the youth of today just as well as it did to the youth of 1996. It is a show that transcends time due to it’s core focus on youth culture. What does it mean to be young any ways? Why do we find youth so compelling? It is that basic human emotion of longing for an innocent time, when the biggest of our worries was homework and chores. A time when we had barely discovered the harsh world that waits beyond those halycon days. It’s something we all try to recapture, a time when we didn’t care or worry too much. Daria is one of those shows that allows us to sit down for 20 minutes or so and reconnect with that time, or for some, discover it for the first time. That is why Daria is ageless, it captures the feeling of being young like few others. Whether it’s alienation, popularity, cynicism or that youthful glimmer of hope, Daria conveys it with deft accuracy and an honest heart.